Thinnest in its category. The IdeaTab S2110 is one of the thinnest and lightest amongst its 10.1-inch peers, complete with a dual-core Qaulcomm CPU and even a docking station for keyboard and touchpad support. The complete package can be had for under $500, but is it a worthy contender against the current crop of Android tablets? Both the IdeaPad and IdeaTab families are first and foremost aggressively-priced entertainment devices with packed-in features enough to satisfy users looking for a decent multimedia experience out of a mobile device. In the tablet space, the budget-oriented IdeaTab A series has run-of-the-mill tablets perfect for movies on-the-go while the second-generation IdeaTab K2 series is expected to be crammed to the brim with impressive features like a 1920x1200 resolution screen and a built-in 4-speaker setup. In between the two extremes lies the IdeaTab S series, which caters to the upper-midrange crowd through its 9.7-inch or 10.1-inch IPS display, 1.5 GHz Snapdragon APQ8060A CPU, 1 GB LPDDR2 RAM and dual cameras. Most notably, the S2110 makes use of a proprietary docking port for keyboard and touchpad functionality. In this review, we take an in-depth look at the IdeaTab S2110 and its keyboard docking station, retailing together for $499. Users who want to opt-out of the dock can purchase the tablet solo for $419. After the somewhat disappointing IdeaTab A2109, will the S2110 leave a better impression? Before even powering on the tablet, the first impression the S2110 gives is its extremely thin-and-light profile. Lenovo touted the tablet as “one of the thinnest and lightest” in its size category during its official reveal at IFA 2012 earlier this year, a claim we can surely defend. Indeed, other popular current-generation 10.1-inch tablets like the Transformer Prime and Galaxy Tab 2 are at least several tenths of a millimeter thicker and noticeably heavier to boot. Even a number of smaller tablets, such as the 9.7-inch 3rd generation iPad and Sony’s 9.4-inch Xperia Tablet S, don’t hold a candle against the S2110 with regards to overall thinness and mass. Besides the small footprint, users will also notice the rather square design of the tablet both front and back. The corners and edges are more distinct all around without any emphasis on curvaceous or rotund perimeters on the back casing to superficially reduce thickness. Because of this, the chassis appears more flat and defined to accentuate the sleek profile that much more clearly. The elegantly textured back is also a very nice touch that deters both fingerprints and glare. Despite this, keen users may still see the back casing as thin plastic and nothing more. As with any super-thin or lightweight device, users may naturally feel concerned about the fragility and build quality. While not completely disappointing, the S2110 has only average resistance to pressure and twisting. The lack of metal alloys has helped reduced the weight to impressive numbers at the cost of a moderately twistable frame and a screen that can be visibly depressed ever so slightly with a firm press of a finger. Workmanship as a result is adequate when standing alone, but it is definitely an overall step down when compared to similarly-sized (and slightly thicker) competitors. The S2110 has a decent number of connectivity options for its class including micro-HDMI and micro USB. The HDMI port was tested with a 1920x1200 resolution external monitor which was able to accept audio and mirror the contents of the internal display automatically, albeit with borders. The tablet did not stretch-to-fit any Youtube or 1080p internal videos during our time with the tablet, but videos still played smoothly and without major hitches. We also tested for built-in USB on-the-go functionality by connecting external USB sticks and Logitech mice and keyboards. The S2110 was able to automatically recognize both the mouse and USB drive, though our keyboard was left in the cold. Note that current U.S. S2110 models will lack SIM card and WWAN functionality. Our review model came equipped with an empty slot where the SIM card reader would normally be, so international or future models of the device may include optional 3G/LTE support. Perhaps just as important as the ports above is the SD card slot, or rather, lack thereof. The S2110 puzzlingly includes no card reader, so users will be stuck with the 16 GB or 32 GB SSD for local storage. Nearly all recently released Android tablets from brand name manufacturers include a built-in SD card reader of some sort, ranging from the Acer Iconia Tab A700 to the smaller 7.7-inch Toshiba AT270 and even the last generation Lenovo IdeaTab K1. This may be acceptable for budget-oriented tablets like the Kindle Fire or Nexus 7 that are half the price, but expandable storage is almost conventional at the $400 price range. Fortunately, the optional Keyboard Dock includes a 3-in-1 card reader and dual USB 2.0 ports as needed. Wireless connectivity includes the typical Wi-Fi b/g/n and Bluetooth 4.0, but goes one step further with an FM tuner across all models of the S2110 for music streaming without the need for 3G or Wi-Fi. There is no built-in app for the FM radio, however, so users may need to resort to third party apps from the Play Store to utilize the feature. Currently, GPS support is only available with 3G, and since 3G models are unavailable, we were unable to test the quality of the GPS receiver. We admit that it’s a bit odd to see GPS as a non-standard feature, especially when most other tablets have the hardware built-in as standard. 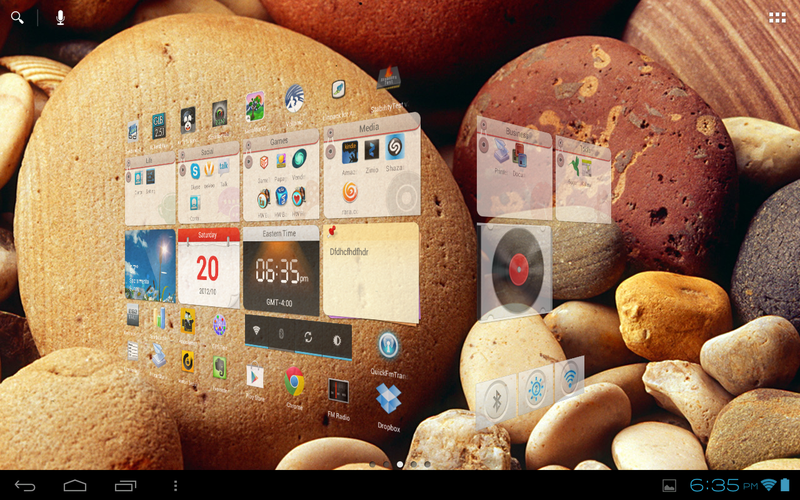 At the time of review, the S2110 was up-to-date running Android 4.0.3 ICS; A Jelly Bean update has yet to be announced. The UI here is similar in form and function to the UI of the recently reviewed IdeaTab A2109 (with auto-rotation enabled by default this time), which means it is still easily navigable and that some of the same problems persist. The identical Lenovo App Store widget that was inoperable in the A2109 has been outright removed by a Lenovo update, but the pre-loaded Weather, Calender and Notepad widgets remain slow to open and animate. The general UI never really hangs, but multi-tasking between applications isn’t quite as snappy as one would hope. 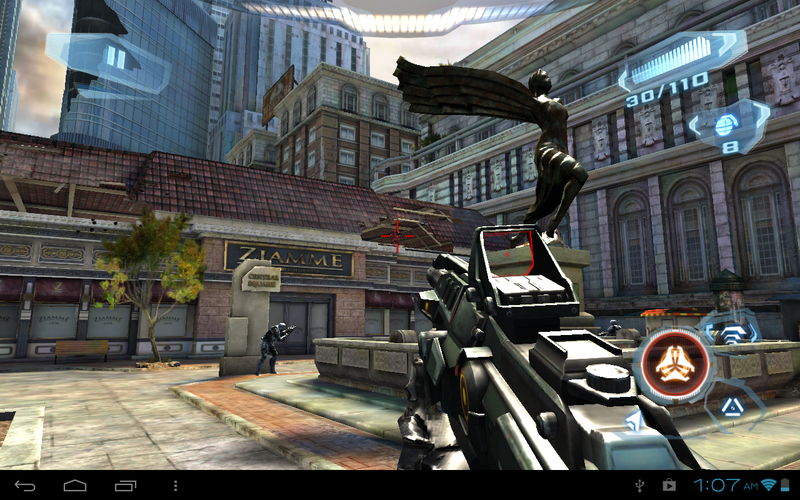 Perhaps most notably, the frame rate of the home screen UI is clearly clunkier than and not as smooth as the Tegra 3-driven A2109. Performance is reduced even further if the screen is littered with apps and widgets at one time. This may just be the fault of the skin and not the Qualcomm processor as downloaded apps and browsers operated like silk and in stark contrast to the home UI in our experience. The choppy animation may not be poor enough to significantly degrade usability, but it is certainly perceptible that user experience will be affected. Whether or not the frame rate issues will be improved in a future update remains to be seen. 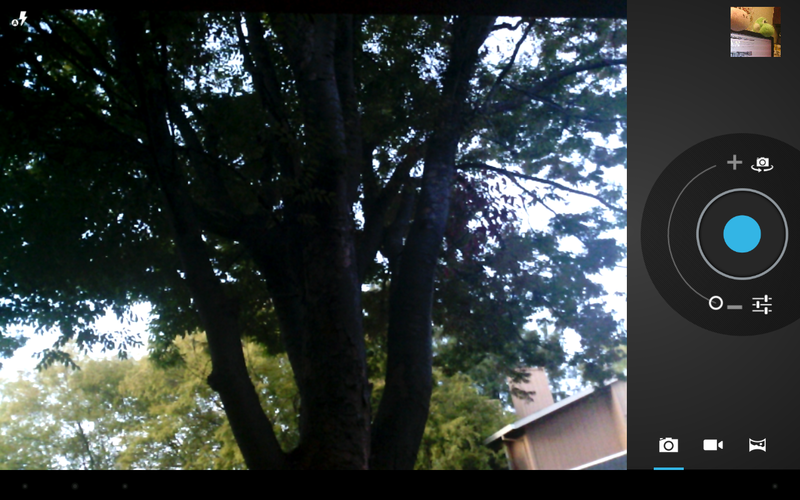 Like many built-in cameras, the 5 MP and 1.3 MP rear and front-facing cameras perform much better outdoors under natural lighting than under indoor environments. 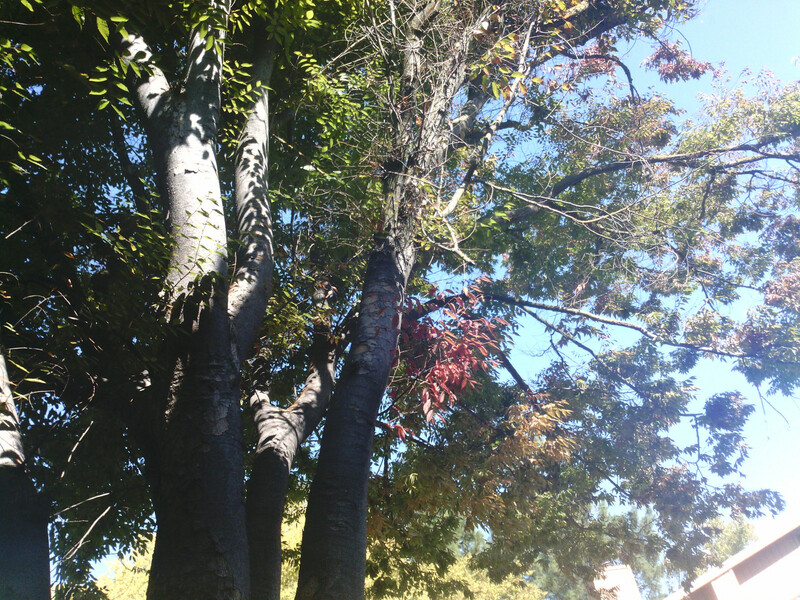 Outdoor snapshots capture colors well, though the image as a whole can still be a bit grainier than competing 5 MP tablet cameras like on the Galaxy Note 10.1 and third generation iPad. Bloom is also easily noticeable and reduces quality around edges should there be brightly lit spots. LED flash is usually a mixed bag in tablets and smartphones, but the S2110 includes one anyway and is best used for close-up pictures as it is not powerful enough for farther distances. In either case, the lag time between touching the display and successfully capturing an image is not instantaneous and will take about 1 to 2 seconds. Note that the rear camera and flash are both located on one corner and are thus easily covered with a finger if the user is not careful. 1080p recording is possible with only the rear camera. Recorded videos are acceptable provided that there is ample ambient lighting and slow panning. The picture immediately blurs should there be fast movement, especially under darker situations where noise and lower frame rates come into play. Sounds, unfortunately, are recorded rather poorly with a fair amount of noise. The S2110 generously includes a couple of full-feature 720p movies from the get-go, most notably Toy Story 3 and Star Trek. 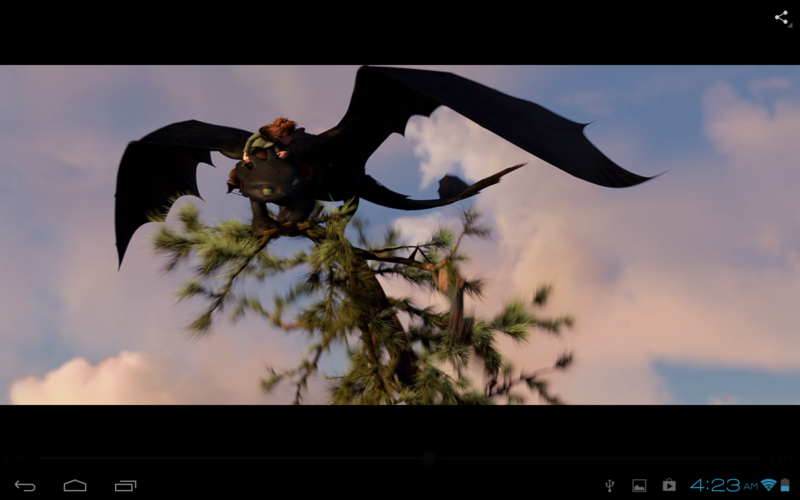 To test 1080p playback, we loaded the slate with How to Train Your Dragon (~1200 kb/sec bitrate) because of the movie’s quick vertical and horizontal pans. The video played flawlessly throughout without any hiccups. Optional items are the typical tablet fare, including a capacitive stylus, screen protector and carrying case. The Keyboard Dock is the most notable and is so far the only accessory to make use of the proprietary connectors on the S2110. The standard one-year warranty applies if ordered directly from the Lenovo online store. The manufacturer offers only one higher tier warranty which extends the coverage to two-years with mail-in service for $80. 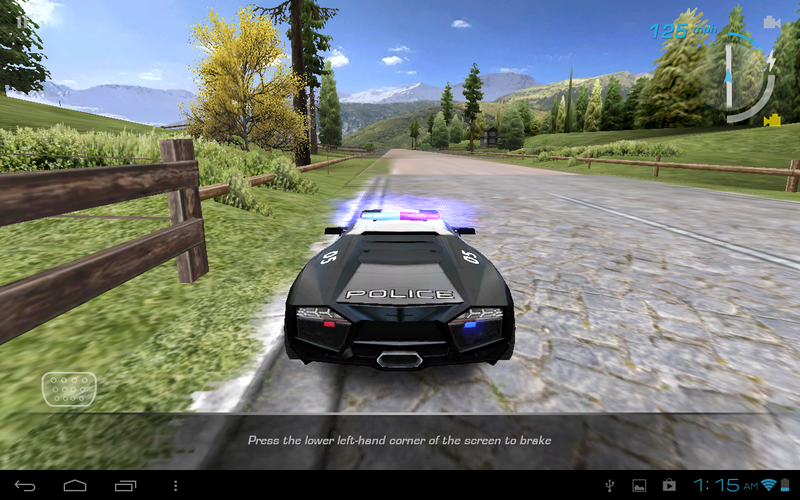 We played a few rounds of 3D titles ranging from the GPU-friendly NFS Hot Pursuit to the more GPU-intensive N.O.V.A. 3, each with good results. NFS played the most smoothly and consistently, while the Gameloft title varied more wildly in frame rates, especially during larger outdoor skirmishes. Nonetheless, N.O.V.A. 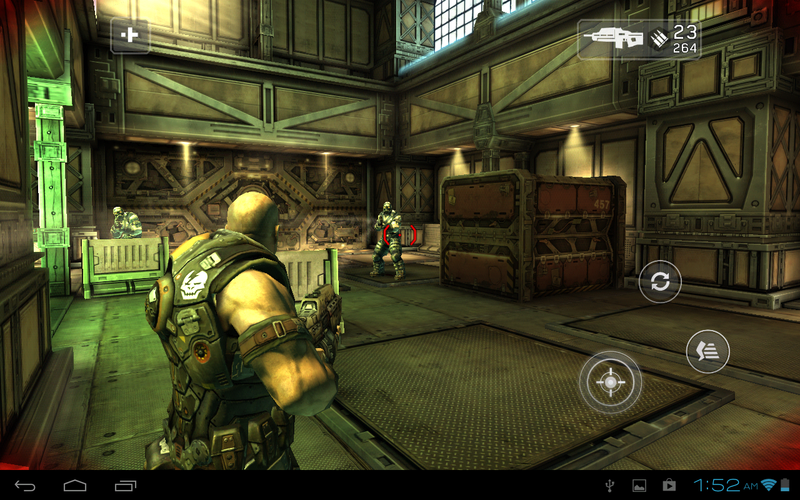 3 still appeared to run a hair smoother than on the Tegra 3-powered Nexus 7. All tested games otherwise performed very well and should be more than playable without issues. The non-backlit optional keyboard dock provides a similar array of Chiclet keys as found on a typical netbook. Individual keys are small as expected on a 25 cm x 9 cm surface area, so it may take some time for users with larger hands to become accustomed to the miniaturized size. Nonetheless, the dock is very well made and is designed with similar colors to the tablet. The dark silver front surface and textured black underside blend in well with the outer frame and backside of the tablet, respectively. Slight edge-to-edge twisting is possible only with a moderate amount of force and the keyboard can be visibly depressed with a firm push of a finger. Both have no bearing on everyday use and overall quality is very good nonetheless. The weight of the dock itself is about 630 g with much of that mass attributed to the extended battery. The combined weight of around 1.2 kg with the tablet attached makes the entire setup feel very dense considering the small size. Since the unit is somewhat top-heavy, the hinge can move back unintentionally if opened close to its maximum angle, but it is otherwise satisfactory in holding the tablet firm when in a stationary position. In terms of performance, the keyboard is excellent. Keys provide a surprisingly satisfactory amount of travel and feedback while staying very quiet as well. The first row of function keys is also very handy for quickly enabling/disabling wireless features and basic multimedia controls. The SD card reader can be a bit difficult to access without first lifting the dock at an angle, though this is only a minor issue. The only major drawback here is that the inputs will sometimes be delayed on the tablet, especially the Home and Print Screen keys which can take up to 2 seconds before it actually registers. Despite the diminutive demeanor and looks, we are pleasantly surprised by the performance and quality of the keyboard dock in general. The touchpad itself (8.5 cm x 4.5 cm) is flat and works as intended, though not necessarily easy to use. Of note here is the very slight input delay from the time the finger moves across the touchpad to the time the mouse icon registers and can be a minor annoyance depending on the user. Multi-touch or even scrolling by finger is not supported here either (unlike the keyboard dock of the Asus Transformer Prime) since users are expected to use the touchscreen capabilities of the tablet instead. The left and right click keys are shallow with solid feedback and are not spongy at all. Still, we found it a bit easier at times to simply use the tablet for clicking and navigating than the touchpad itself. Note that the mouse cannot click and highlight lines of text as one would on a Windows platform. Attempting to do so will result in scrolling the screen up or down. This functionality can make selective copying and pasting a bit of a hassle. At 1280x800 pixel resolution, the glossy display is very similar to midrange 10.1-inch tablets like the Fujitsu Stylistic M532 in terms of pixel density. Certain smaller tablets have the same resolution as the S2110 including the 9.4-inch Xperia Tablet S and 7.7-inch Toshiba AT270, resulting in crisper texts at smaller sizes than the Lenovo. The current trend for higher-end tablets is to pack in 1080p resolutions or even greater, but we found ourselves to be satisfied with the colors and quality of the Lenovo display for movies and browsing. Screen brightness is very good at an average close to 350 nits, which is moderately higher than a number of 10.1-inch tablets including the similarly-sized third generation iPad. The brightness here is only significantly bested by more expensive models such as the Transformer Prime and Stylistic M532, both of which have superb performance outdoors despite their glossy displays. For indoor use, most users may find the 60-80 percentile brightness range to be most comfortable as the maximum brightness setting produces whites that can be straining on the eyes. Contrast is similarly very good and in line with current tablet IPS displays. The S2110 is excellent for outdoor use when at a high brightness setting. Glare, though still visible, becomes almost non-issue as we found text and images to be crisp and easy on the eyes. Use under direct sunlight is possible should it be unavoidable. Combined with the light weight and portability, the S2110 is one of the easiest tablets to use and share in an outdoor environment. Viewing angle stability is also very good as expected from an IPS panel. We had no issues using the tablet in any orientation as colors stayed consistent even at extreme angles. Contrast changes, signified by a faint purple hue on pure black areas, can be observed, but only at acute and unrealistic viewing angles. Peripheral viewers may notice a drop in brightness or be irritated by an increase in glare, however, so it may be beneficial to up the brightness if sharing the tablet with others. The 1.5 GHz dual-core Snapdragon APQ8060A CPU in the S2110 has many similarities with the MSM8960 as found in certain North American HTC One series of smartphones and others. Both are Krait processors manufactured on a 28 nm process and use integrated Adreno 225 graphics. Unlike the MSM series, the APQ series of Qualcomm processors lack integrated support for cellular basebands, meaning incompatibility with CDMA, GSM and LTE networks and explains the lack of 3G/SIM card support for the current U.S. models. Despite having half the cores as Nvidia’s flagship Tegra, the dual-core 8060A is on par with many of today’s Tegra 3-based devices in many of the benchmarks shown below. Graphics performance is a standout according to GLBenchmark. Results from Antutu v2 are below what we were expecting at thousands of points less against the competition. Upon deeper inspection, we found the RAM, CPU Integer and floating point scores that make up part of the final score to be lower than competing Tegra 3 tablets by up to half. 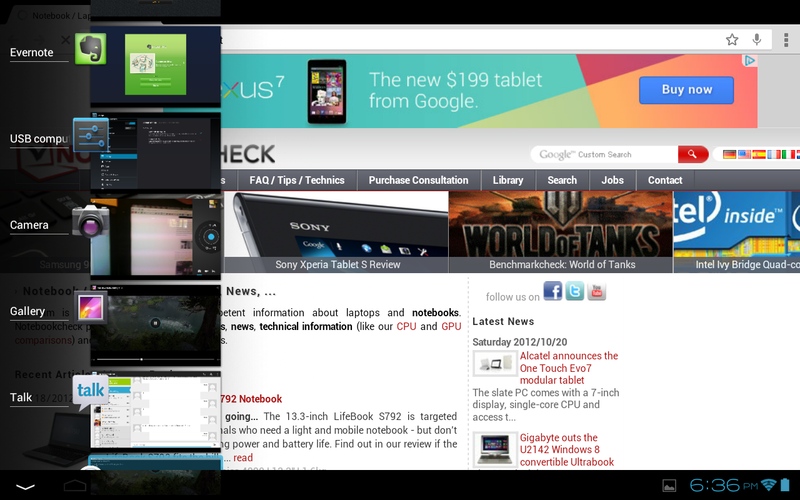 Even so, browsing performance can be just as smooth as any other Tegra 3 tablet, at least when no heavy multi-tasking is involved. The S2110 starts to slow if the user is doing too many things at once. Surface temperatures when idle are similar front and back at about 28 degrees C on average. To simulate load, we ran the Stability Test 2.5 CPU+GPU stress option for over an hour. Load temperatures were then measured and recorded below. The temperature gradient widens significantly when under load, ranging from a recorded 30.2 degrees C on one end up to 44.4 degrees C on the other. While certainly not one the hottest tablets we’ve reviewed (that record currently held by the Iconia Tab A700), users should expect the S2110 to become warmer much more quickly than other tablets during videos and multi-tasking use. Tablet hotspots are usually much more pronounced compared to notebooks due to the lack of an active cooling system and the S2110 is no exception. In particular, the left-hand side of the tablet face can become several degrees hotter than the other end, which translates to uneven warmth between hands. Our load temperature measurements were recorded under near-worst case scenarios, so most users will likely never experience any overwhelming surface temperatures. The stereo speakers are located on the left and right edges, respectively, and face toward the sides in opposite directions. Sound quality is shallow with a very narrow range and weak bass reproduction. Music is noticeably more high-pitched than is typical from tablet speakers and has a “tinny” quality reminiscent to older netbooks. While acceptable for the occasional videos, we would recommend external solutions through the 3.5 mm jack for better quality during movies and extended music sessions. It’s reasonable to believe that the ultrathin form factor may be the limiting factor on the speaker hardware, especially when less expensive tablets like the Nexus 7 or Lenovo’s own A2109 can have better sound reproduction. Maximum battery life was tested at minimum brightness with radios off and left to idle. At close to 20 hours, the S2110 surpasses most tablets in the idle test and comes close to the third generation iPad. Similarly, minimum battery life was tested at maximum brightness with radios on and left to run Stability Test 2.5 to stress the CPU+GPU. The tablet was able to last for 3 hours and 43 minutes under these conditions. Our more realistic WLAN test leaves the tablet running our standardized script to simulate typical browsing conditions at a display brightness of about 150 cd/m2 (50 percent setting). The tablet automatically shuts down at about 8 hours and 15 minutes. Average runtimes are good and more or less similar to a few recent Android tablets in the market, namely the Fujitsu M532 and Xperia Tablet S. However, the wide range between minimum and maximum will mean very wide runtime results depending on user preferences and settings. 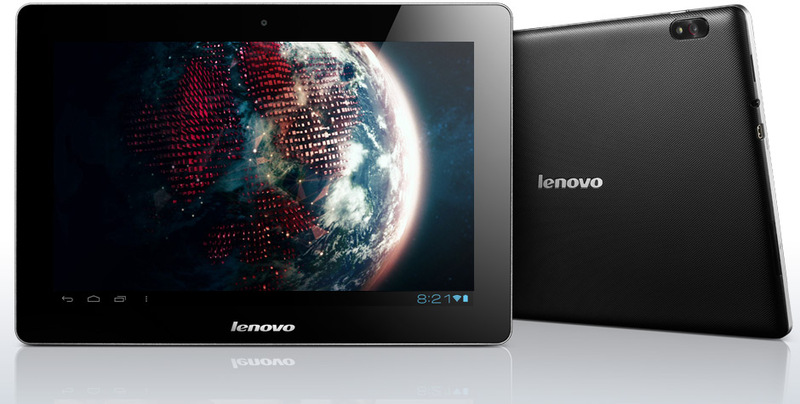 Lenovo promises 10 hours of constant web browsing with the S2110, which is certainly reproducible. Those needing even longer hours can attach the keyboard dock for its built-in battery, adding another 8-10 hours of use. This combination allows for heavy all-day usage without having to worry about the battery during the middle of the day. Overall battery life is quite notable given the very thin build. From a hardware standpoint, the IdeaTab S2110 provides all the necessary specs to make it an excellent outdoor tablet. The super-thin profile, light weight, great battery life, and bright IPS display make the S2110 fun and easy to use both indoors and on-the-go. The small size and weight does come with some expected tradeoffs, in this case build quality. While the tablet looks great, resistance to flexing is average and in general not as robust as competing tablets with aluminum bracings. It may behoove the user to keep the tablet in one of Lenovo’s Folio Cases for added protection, especially if the device will be traveling often. Outside of the hardware, the software can at times be underwhelming. The overlying skin could use improvements and smoother performance all around. Navigation is not exactly difficult, but nothing about the tablet feels as instant as we are used to. A moderate amount of multi-tasking is enough to delay actions by a slight but perceptible amount. 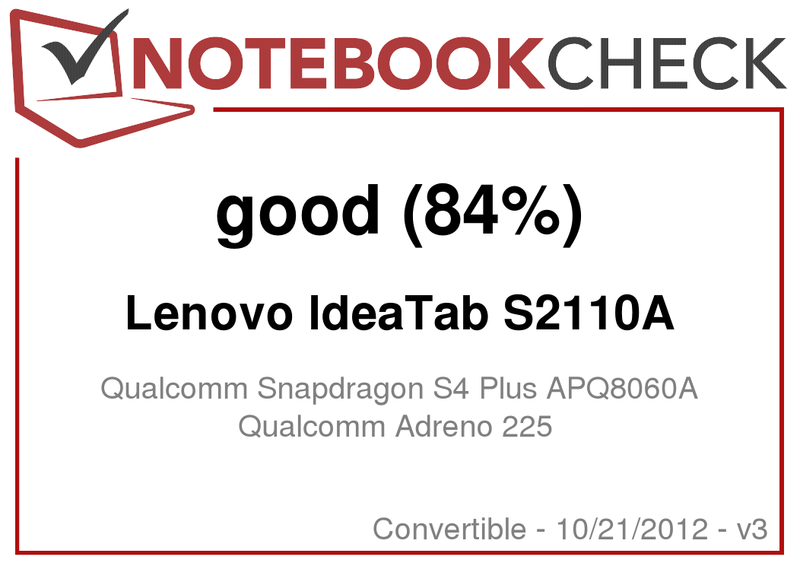 Purchasing an IdeaTab S2110 will mean sacrificing some software performance for a sleek and long-lasting tablet. As a result, users looking for a very lightweight and portable 10.1-inch slate for simple tasks or movies will be very satisfied. The S2110 is a real eye candy with physical features that perfectly reflects its price point. Due to its extreme portability, thinness, bright IPS display and long battery life for its size, the Lenovo tablet is very easy to use in outdoor environments. The docking station is a huge plus that extends the usability of the tablet even further with additional ports and a secondary battery. Increased system performance is a must for future iterations. 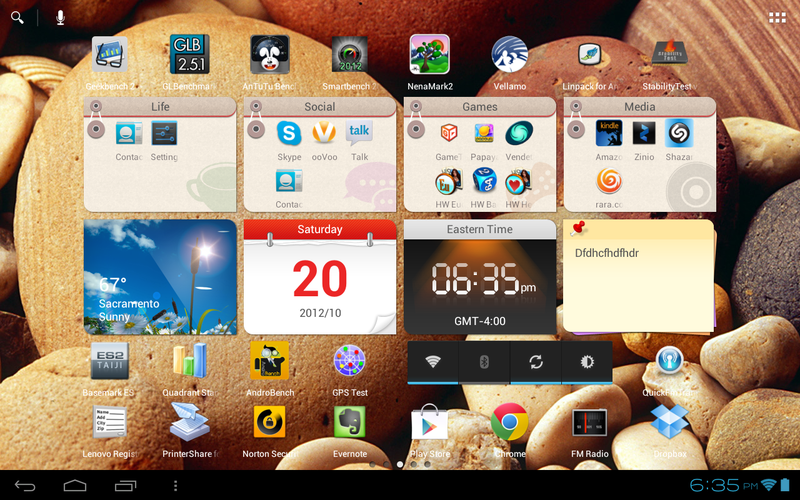 Multi-tasking is not as smooth as we had hoped and the homescreen UI responds slowly. The keyboard dock, while satisfying to type on, faces input delays at times. U.S. models with WWAN/GPS support would further improve the tablet as a traveling companion. Build quality is only average compared to the current crop of Android devices. Battery life is better than expected for a tablet this thin. The visual appeal of the docking station with the tablet attached has a classy matte look and feel, much better than the netbooks of old.